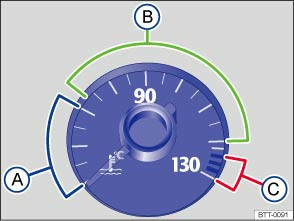 In normal driving conditions, the needle will be in the middle section of the scale. The temperature may also rise when the engine is working hard, especially at high ambient temperatures. Several warning and indicator lamps will light up briefly when the ignition is switched on while the vehicle runs functional checks. They will switch off after a few seconds. Warning area Coolant temperature too high. Do not drive on! Stop the vehicle as soon as it is possible and safe to do so. Stop the engine, let the engine cool down until the needle is back in the normal area. Check the coolant level . Normal area Coolant level too low. After the engine has cooled down, check the coolant level and refill engine coolant if the level is too low . There is a fault if the coolant level is correct. -- Fault in the coolant system. Do not drive on! -- Engine coolant temperature is too low in vehicles with natural gas engine. Avoid high engine speeds and heavy engine loads. Cold -- Avoid high engine revs and heavy engine loads until the engine is warm. Fault in the coolant system. Use expert assistance! Failure to observe the warning lamps and text messages could lead to your vehicle breaking down in traffic, accidents and serious injuries. Always pay attention to warning lamps and text messages. Never ignore warning lamps and text messages. Stop the vehicle as soon as it is possible and safe to do so. Failure to observe the warning lamps and text messages could lead to your vehicle being damaged.